Longbow and bow set on grass. Yew is typically regarded as the best wood for making longbows. However, as individual bowyers have their own preferences, some choose to make longbows from white oak, red oak, hickory, red elm, American elm, Osage orange or rock maple instead. Medieval bowyers used yew almost exclusively for making the famous English war bows, which were the staple of England’s armory for about 400 years. Longbow woods must be able to withstand two different types of stresses. 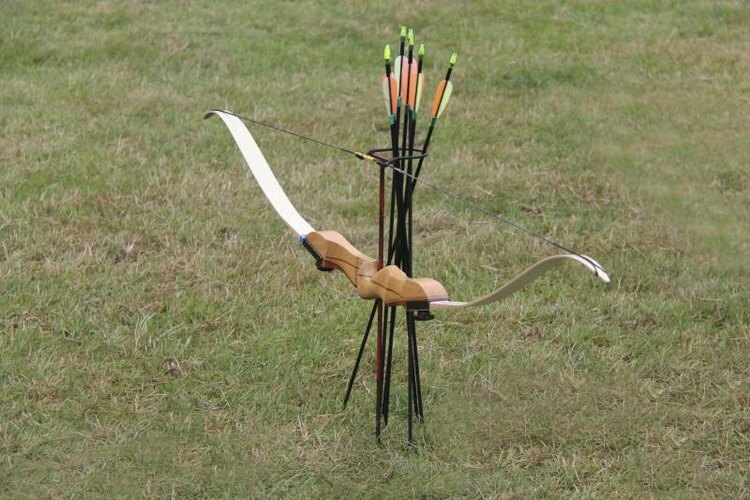 The back of the bow – the part that faces the target – must have a high tensile strength. Conversely, the belly – the part of the bow that faces the archer – requires a high degree of compressive strength. This leads many modern craftsmen to use more than one type of wood to construct the bow. They will use one wood for the bulk of the bow, and use another type of wood as a back. One of the reasons that yew is such a suitable wood for longbow construction is that it is a good material for both the back and belly of a bow. The sapwood of yews, which is the light-colored, outer portion of a branch or trunk, has a high tensile strength; and its heartwood, which is usually dark-colored and found in the center of a tree or large branch, offers high compressive strength. By using a single piece of wood that contained both heartwood and sapwood, bowyers of medieval England could construct high-quality longbows out of a single piece of wood.